Innovation and the development of advanced technologies are central to our strategy. Our research and development programme includes technologies to manage carbon dioxide emissions and to make alternative sources of energy commercially available. Advances in research and development (R&D) can help meet the world’s growing energy demand and reduce the impact of our operations. We also use R&D to help develop new businesses where we can apply our existing knowledge and skills. For example, the handling and sale of biofuels is similar to our existing business, and we are able to expand into new areas, such as the production of biofuels, supported by R&D. We have leading scientists working in our technology centres around the world, including major centres in the Netherlands, India and the USA, whose work includes developing cleaner energy technologies. Research in the Netherlands has included turning natural gas into transport fuel and other liquid products (gas-to-liquids or GTL) as well as developing more efficient chemical processes. In both the Netherlands and the USA, scientists are researching opportunities to provide liquefied natural gas (LNG) as a transport fuel. In India, our research includes more effective ways of boosting oil production from existing fields, improving water management and energy use in our operations. People outside of Shell are encouraged to come to us with their innovative ideas. Our GameChanger programme identifies and helps develop ideas that could have an impact on the future of energy. This includes finding ways to produce energy from cleaner sources. GameChanger offers financial support and expertise to take ideas through to testing. GameChanger funded early research that led to the development of the Prelude floating liquefied natural gas (FLNG) facility, a project to turn natural gas to liquid at sea. It is designed to produce and liquefy gas and then transfer it to LNG tankers. This eliminates the need for complex infrastructure such as pipelines to shore and loading jetties, and reduces the environmental footprint. When built, it will be the world’s largest offshore facility, with a hull measuring nearly half a kilometre in length. Shell Technology Ventures (STV) is our corporate-venturing arm, which invests in companies across the energy sector to speed up the development and deployment of new technologies which complement our business. It offered funding and expertise to California-based company, GlassPoint. This followed a decision by Petroleum Development Oman (Shell interest 34%) to select GlassPoint for a demonstration project. GlassPoint’s technology uses moving mirrors that focus sunlight on water-carrying pipes to capture solar energy and generate steam – using sunlight instead of natural gas to boil water can reduce carbon dioxide (CO2) emissions by up to 80%. 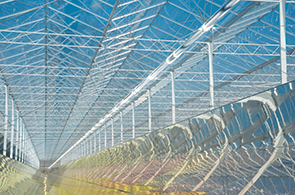 Glasshouses protect the mirrors from sand or dust and wind. We saw the potential to use the GlassPoint technology to produce the steam sometimes injected into oil reservoirs to boost recovery. Shell is working on ways to capture CO2 from power plants and industrial facilities and store it safely underground. We support a number of carbon capture and storage (CCS) demonstration projects around the world. For example, Quest is the first project to reduce CO2 from oil sands operations in Canada (see “Carbon capture and storage”). We are also developing new ways to capture emissions. Shell Cansolv offers gas-processing units to industrial customers to capture sulphur dioxide (SO2), which contributes to local air pollution, and CO2. The technology can be added to an existing plant or incorporated into a new installation. The CO2 can be sold to oil companies to inject into reservoirs to boost oil production, or be stored safely deep underground. In 2013, Shell Cansolv and RWE nPower started operations in the UK to capture both SO2 and CO2 at the world’s first demonstration plant. We continue to work on improving the energy efficiency of our existing operations. By reducing heat loss or power use, we can also reduce CO2 emissions. In 2013, we improved a cooling system within a gas-gathering network at our Magnolia tight gas operations in Louisiana, USA. Through improved monitoring we were able to shut down around half of our air coolers and the associated small gas engines that were providing power. This led to a reduction of 28,000 tonnes in CO2 emissions. A 1% improvement in energy efficiency across our manufacturing sites is equal to $5 million to $7 million savings per site. A new energy monitoring system has improved efficiency in energy, mainly due to CO2 and energy management. Used across 20 of our manufacturing sites, this has led to savings of more than $20 million in 2013. Renewable sources will help meet the growing demand for energy, but energy from wind and the sun is intermittent. One way to overcome this is to store the wind and solar energy until it is needed, such as during peak hours. This can be done by taking electricity generated from renewable energy and using it to create different energy sources that can be stored. Our Future Energy Technologies team, set up in 2010, is researching ideas for energy storage technologies such as batteries, compressed air, heat, water pumped to a high elevation, or hydrogen. For example, liquid hydrogen could be stored underground in salt caverns and then turned back into a gas to release its energy in fuel cells or through combustion. We are exploring ways in which hydrogen can be used for road transport. We have hydrogen filling stations in Germany, Japan and the USA that allow us to evaluate a range of different technologies.